Petrović suggests that the Dardanians of the Triballian land refer to the area of South Morava and Nišava rivers. It follows that this territory was not of primary concern to the Romans prior to the campaign of Crassus. These struggles clearly show that the Romans were trying to establish their authority upon an otherwise unconquered region. Regarding the Dardanians themselves, there is no report on whether the troops of Crassus fought against them directly. The fragment presented above apparently also refers to Dardania either as an entity that had revolted against the Romans or as one that had resisted the Roman rule. In fact during 28-15 B.C.E., Dardania may have temporarily been included within the administrative boundaries of the Macedonian province. It can be assumed that no permanent Roman garrison was stationed in Dardania prior to 16 B.C.E. This assumption is made based on the fact that in 16 B.C.E., the assault of the Scordisci against the province of Macedonia was not met with an organised resistance in Dardanian territory. It was only one year later (15 B.C.E. ), that the large province of Moesia was created including within it the Dardanian territory. 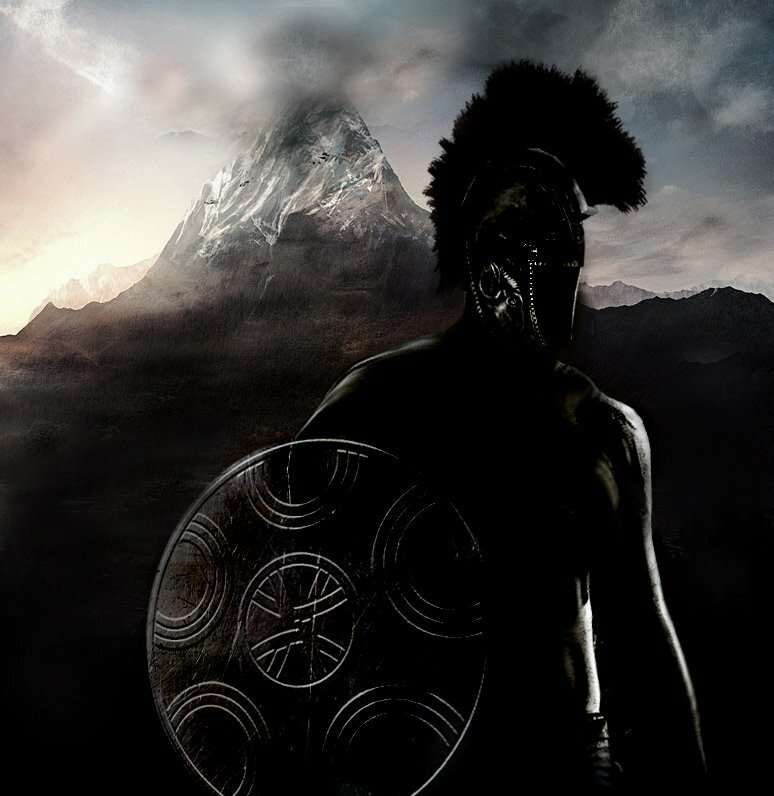 Artistic depiction of an Illyrian soldier equipped with an Illyrian helmet and shield with a mountain on his back suggesting the roughness of the terrain. The inclusion within the province of Moesia put the Dardanians under an unnatural administrative and legal framework. The traditional relations of Dardania with the southern territories of the Mediterranean were ignored in favor of an administrative unit that was oriented towards the northern regions of the Danube. The general population apparently did not support this administration. Their dissatisfaction was expressed in continuous raids against Roman cargos and merchants, carried out by Dardanian rebels (latrones Dardanianicii). In 86, the administrative reform of emperor Domitian resulted in the division of the Roman province of Moesia into two parts: Moesia Superior and Moesia Inferior. This main purpose for this division was the Roman aim to better protect the Danube front line. This division did not change the northern orientation of Dardania, now part of Moesia Superior. However, it may have increased the importance and the weight of the Dardanian territory as a land rich in ores within a province that was roughly twice as small as the previous province of Moesia. Also, a Romanization process helped in establishing a more efficient Roman rule over the territory. Dardania and Upper Moesia was considered of crucial mining importance for the Roman Empire in the same manner the Africa proconsularis was considered of crucial agricultural importance. Within the province of Moesia Superior (Upper Moesia), apart from the military/legionary territories, municipal territories, and private estates, Dardania represented one of the four major divisions each named after local tribes, alongside the lands of the Pincenses/Picenses, Tricornienses/Tricornenses, and Moesi up north. The rich mining lands across Dardania, as in all Upper Moesia, belonged to the imperial treasury (fircus). The remaining territories were occupied by native tribal settlements (civitates peregrinae). The native inhabitants had the obligation to work into the mines or in other estates of the imperial treasury. An important administrative centre was established in Ulpiana. Meanwhile, the whole Dardanian territory was composed of several centres grouped together into some few areas (civitates Dardanicae). These areas were developed in accordance with the economic interests of the fiscus and especially based on the mining centres that constituted the Metalli Dardanici complex. There were at least five such areas established across Dardania and their centres were notably: I) Municipium Dardanorum (Socanica), II) Ulpiana, III) Remesiana (Bela Palanka), IV) Timacum Minus (Ravna) and an additional centre located somewhere near Lamudum (Lopate), Vizianum (Konjuh), or Kratiskara (Kratovo). The Roman military administration was responsible for the unity of fiscal organisations and peregrine. The Roman troops protected the mining areas while also being involved in the ore mining process itself and mining administration. The road network, along which precious monetary cargos were transported, also required the protection of the armed troops (especially after 250). Thus, along the territory of the Dardanians, the order was maintained by the cohorts or local militias such as cohorts I Aurelia Dardanorum and II Aurelia Dardanorum. These cohorts were presumably established by emperor Marcus Aurelius around 169, during the wars of the Marchomani. The I Aurelia Dardanorum must have been based somewhere at Timacum Minus (Ravna) and/or Timacum Maius (Knazhevc). The II Aurelia Dardanorum was based at Naissus but the epigraphic evidence suggests that it also served in other forts, notably at Timacum Minus (Ravna), and Praesidium Pompei (near Aleksinac). Both these cohorts, each with 600 soldiers, were apparently created out of Dardanian latrons. By distributing them at the northern border of Dardania, the emperor Aurelius decreased the danger of cargo raids from latrons across Dardania. Regarding the protection of the mine districts, other local units were established to carry out this function during the I-II centuries. This was the case of the Ala Vespaziana Dardanorum, that consisted of 500 Dardanian knights and that protected the mine region of Artanë/Novobërdë-Kopaonik. Ptolemy mentions Naissus as being one of the four main towns in Dardania. The epigraphic text Naisso Dardaniae discovered in Rome and pertaining to the Early Principate period supports the statement of Ptolemy. In 279, the province of Dardania was created as part of the prefecture of Illyricum (praefectura praetorio per Illyricum). This reform by emperor Diocletian reestablished the traditional relations of Dardania with the Mediterranean realm. The borders of the Dardanian province were almost the same as the ones of the ancient Dardanian kingdom, apart from the northeastern part which was awarded to the already established province of Dacia Ripensis. 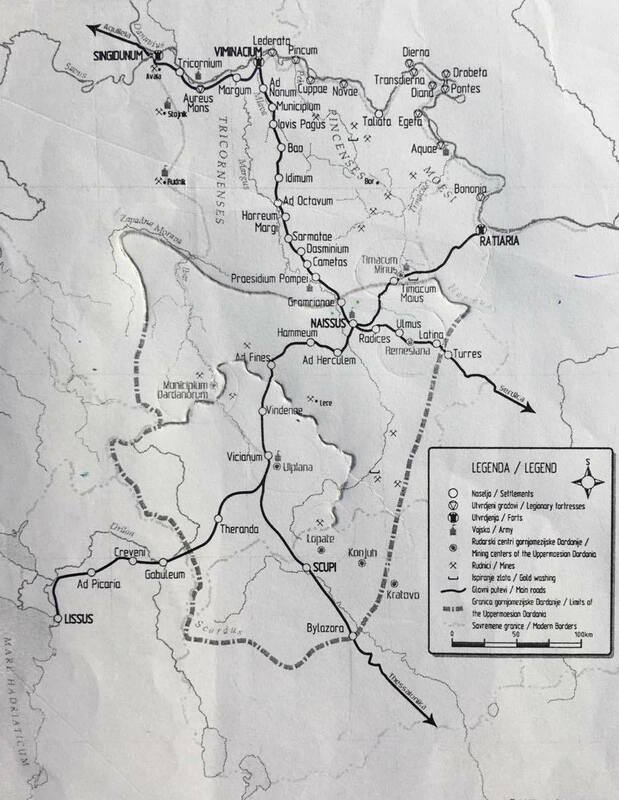 Map of Upper Moesian Dardania published by Vladimir P. Petrović. The borders of ancient Dardania and modern Kosova are also shown. The land route Lissus-Naissus-Ratiaria (Lezhë-Nish/Nis-Ratiaria), that passed mostly through Dardania, provided the shortest land route that linked the Adriatic Sea with the Danube River and Danubian frontier. Appiani, Historia Romana, Illyrike, 28. Dionis Cassii Cocceiani, Historia Romana, LI.